Mom in Two Cultures: Missing! Can You Help? 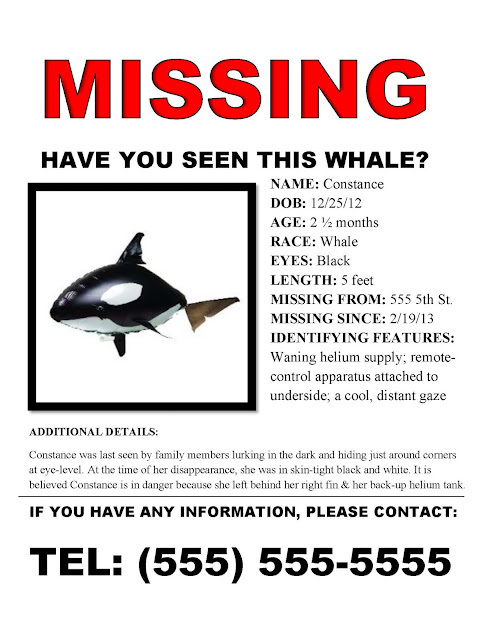 Okay, so we may have lost a five foot long whale Air Swimmer. One day she was lurking around corners scaring the holy heck out of me when I came down in the pre-dawn darkness to start breakfast and tailing me late at night as I worked, and the next day she was gone. I'll be honest, I'm not exactly sure when she disappeared, but I remember seeing her on Monday, so there's that. My guess is she got tired of just hanging around. Sky played with her exactly five times between her arrival and her disappearance. Stow, on the other hand, loved her and enjoyed standing on the couch, grabbing her, wrestling her to the ground, and pulling off her fins. I may have unlovingly shoved her across the room hourly a time or two. Still, her great escape took some planning. I mean, how'd she get out the back door and off the screened-in porch without anyone seeing? And once she was in the yard, how did she manage to get over the fence in the freezing cold? Surely someone saw her making her way down the street. I mean, really, how far could she have gotten? All I know is that it's the first time I can literally say that my money vanished into thin air. I just hope she's made her way to a happier place. PS-- please don't call the phone number on that poster because it's obviously fake (Sky wanted me to say that).